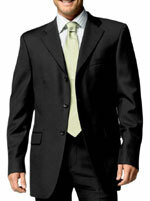 Business suits are a significant part of the wardrobe. These versatile pieces of clothing can be worn to business meetings, job interviews, formal occasions and more. When matched with a dress shirt and a silk tie, a tailored formal suit can make the person wearing it appear very presentable and professional. Suits, especially mens designer suits, are also not exactly inexpensive; thus, it is important to know how to take care of them, so they can stay in excellent condition for a very long time. The following guidelines will help you in caring for your suit, whether it is a mens suit or a womens suit. Remember to unbutton your jacket and pull your dress pants up before you sit down so the fabric does not get tugged. Avoid putting too many things in your pockets, as doing so can strain them and cause them to tear or lose their shape. Do not wear the same suit or tuxedo two days in a row. Let it rest for a day to prevent creases and to keep it from wearing out quickly. Keep your suit outside your closet over night after wearing it to let any moisture dry up. This will also help rejuvenate the fiber on a wool suit. Brush your formal suit with a clothes brush after wearing to remove dirt and lint buildup. If you have a wool suit, doing so will prevent the fabric from shining. Do not rub on spots or stains as this will only set them deeper into the fabric. Dry clean your mens suit or womens suit only a few times per year, or as needed. This will increase its lifespan. Have your mens suit or womens pants suit pressed each trip to the dry cleaners. Do not pack or hang your dress shirt and formal suit between lots of other clothes to avoid wrinkling and discoloration. Hang your mens designer suits, womens pant suits or tuxedo on wooden hangers with rounded shoulder supports and store it in a garment bag. Metal wire hangers are a no-no for long storage periods. If a hanger is unavailable, fold your suit jacket inside out with the shoulders touching to prevent dirt from staining the outer fabric. Fold your dress pants neatly. Only use a professional dry cleaning service for your suits. They can also press it for you. Let your dry cleaners know if there are any spots or stains that require pretreatment. If these are missed, they can be very difficult or even impossible to remove. When picking up your suit after dry cleaning, make sure that it is not cramped in its plastic bag. Once you get home, take your suit out of the bag and let it air out. Bouquet Cleaners can provide all your business suit dry cleaning needs. Just bring your men’s suits, women’s suits, dress shirts, tuxedos or wool suits to any one of our two Santa Clarita locations and we’ll do the rest. We’ll make sure your suit is crisp and clean when you come pick it up. Is there a rip or button missing on your formal suit? Or maybe it does not fit you the way it should? No problem at all. Aside from dry cleaning, Bouquet Cleaners also offers professional suit repair and tailoring services. If you are unable to personally drop off or pick up your suit, just give us a call and we’ll gladly pick it up, dry clean it and deliver it back to you. For inquiries or service quotes, you may reach Bouquet Cleaners at (661) 297-3856.